For me life is a continual process of learning and this blog is no different. I started Erin’s Inside Job a year and a half ago because I was so inspired by other stories that I read and I felt like I had one of my own to share. Along the way it developed into a passion where I was able to combine my love of writing, fitness, and ALL THE FOOD. And you know what? People listened. Definitely not at first, but as I found (and continue to find) my voice, I started to connect with readers and it has been an incredible experience. If I had to start over again there are definitely a few things that I wish I had done differently when starting this blog and I wanted to share them with you. When I started this blog I just wanted to get my emotions and experiences out. I didn’t have any grand plans of monetizing or growing it into anything specific, so I didn’t think I needed anything more than a free site. Being self-hosted has allowed me to take Erin’s Inside Job to a different level and I only wish I had done it sooner. I also wish I had started on WordPress. I went from Blogger to WordPress.com to WordPress.org in a little over 6 months. There were migration headaches, broken links, and wonky formatting that I still have to go back and fix at some point. Take the time to think about where you want your blog to go. In the back of my mind I always had a desire to grow it into more than just an online journal, but I didn’t go for it because I doubted myself and my abilities. If you have any inclination to grow your blog, even the smallest one, I would say to make the investment sooner than later. It was only recently that I was able to proudly say that “I’m a blogger” when someone asked me what I do. Before, I would surround that statement with a number of qualifiers, mumble, or even have it somehow sound like a question when I said it. Even though it was the thing I loved doing the most, I didn’t feel qualified to be proud of it because I wasn’t making a certain amount of money or have a certain number of followers. Once I started treating this blog like it was important, I became more confident in my abilities and starting taking more risks which have begun to pay off. One of the best things I have heard on this subject was from another blogger. She said “if you want your blog to be big, act like it already is.” The more support I give myself and my brand, the better return I will get. I started with a free 14-day trial of CoSchedule and then liked it so much that I paid to continue using it (you can read my full review here). Since then I have been able to plan out posts well in advance and conveniently move them around if I want to post something else that day. I also schedule all of my social media at the same time I write my post so that’s another thing I don’t have to worry about once I hit publish. Even if you don’t use a dedicated service like CoSchedule, taking the time to plan out posts and put some time into them will pay off. I get caught in the comparison trap WAY too often and it’s something that I continually struggle with. When I started blogging I immediately began to imitate other blogs in their frequency of posting, topics, and style. It’s true that I learn a lot from other bloggers, but if I start copying them verbatim then I will likely lose what makes me an individual and then what’s the point? No one wants to read a thousand blogs that are all the same. Everyone has something unique to offer, whether it be a perspective, experience, or skill, and you just need to figure out what yours is and roll with it. These days I write for me and not how I think people want me to write. I write for me, but I also write for you because I want to share the things I have learned and help you become the best versions of yourselves. The more authentic we are in what we share, the more people will resonate with that and keep coming back. The blogging community is amazing. People are so supportive and I have made some awesome connections with people. I used to read blogs without commenting until I realized that commenting actually started a relationship that could be nurtured. I’m talking about actual, meaningful comments and not the one-line “that is awesome!” comments. By reaching out to other bloggers through email, social media, and post comments I have been able to develop lasting relationships. If you are looking to grow your readers, take the time to invest in them as well. 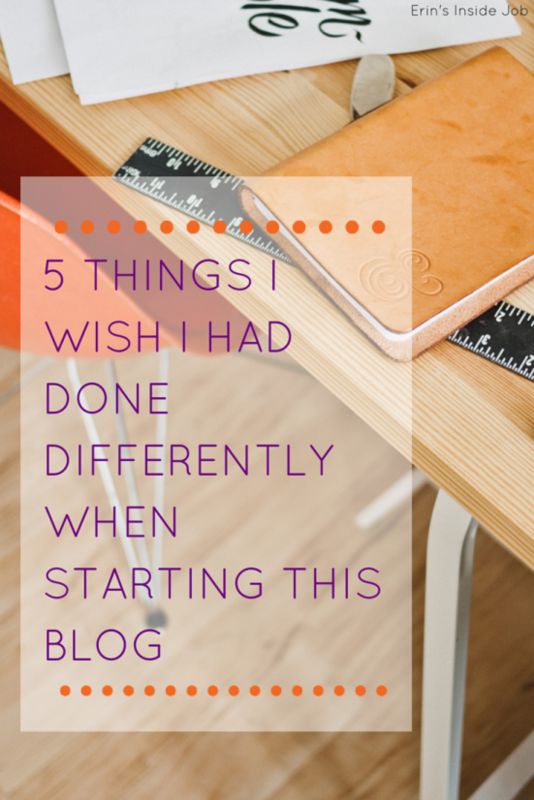 Bloggers: What would you have done differently? Non bloggers: Why do you read the blogs you do? An editorial calendar from the beginning would have been great. There are so many posts that I did in the beginning that I feel have gotten lost, or guest posts that I did that I wish were on MY site, not someone else’s. But overall, I think I am happy with how my blog has progressed from where it began. I can’t say that it has even deviated all that much. But the investment in other bloggers is the most critical thing–that is how I’ve developed the relationships that are part of my real life as well. Definitely true! I have learned the most from blogger meet ups and conventions where we are all able to share ideas. Self hosting? Do it!! I just saw this on pinterest and took a moment to pop over and I am glad I did. A few years ago I started to blog and have flip flopped from wordpress to blogger back to wordpress. #2 struck a sounding chord with me as I would mumble that I blog and brush people’s interest off instead of sharing it with them (because I didn’t feel like I knew what I was doing or if it was good enough). So thank you for writing this post! I will pick-up my new blog and treat it like a pet and give it the care I want to give it and make it important. I just signed back up with wordpress! Thank you! I can totally relate! Even though I was super proud of my blog, I couldn’t act that way around other people because I was afraid of their responses. I still struggle with it sometimes but I have gotten a LOT better! So glad you are back to blogging!! I need to use an editorial schedule, but I am not yet self-hosted. I will have to stick with the one that comes with WordPress. But yes, I should have been doing that and using one for a long time! Cheri @ Overactive Blogger recently posted…Rock ‘n’ Roll – First time Marathoner! The WordPress one is helpful too I have heard. Basically anything that lets you take a look ahead and plan things out is a huge help. I also have a notebook on my desk for jotting down ideas as I have them. #4 is my favorite on this list! I almost didn’t start my blog because I thought, ‘Does the world really need another blogger?’ When I mentioned this to my career coach she said, ‘The world needs people expressing who they are.’ That really resonated with me and I go back to that every time I start thinking I need to look and sound like other bloggers. It’s so easy to fall into the trap of comparing yourself to everyone else but in the end, it’s being yourself, no matter what, that helps you to stand out AND feel good about yourself! Thanks for your insight, this newbie appreciates it! An editorial calendar is a GREAT idea. Even if it’s not a paid one like I use, WordPress has its own editorial calendar that can be helpful. Also just writing future post ideas out can help a lot and I have a notepad with all kinds of scribbles on my desk so I can refer to it. Also, I’m serious about discussing these donuts. I think getting past the comparison trap was the hardest part for me when I first started, and I still struggle with it at times. I have a little sticky note at my desk that says “stop being consumed with what everyone else is going! Just be you!” Seeing that reminder every day has definitely helped! I so agree about being self-hosted, but you live and learn right? Remembering that it’s my blog has been the biggest challenge for me and learning to let go of what I “think” other people expect from me. It’s so much more enjoyable to do what I want and not feel like I have to conform. Exactly! I can easily get sucked back in though so I need to make sure that I keep reminding myself of that. Thanks for reading Melissa! Everything you said.. I love this post so much! I’m in the process of moving everything from Blogger to WP, it’s such a hassle. Totally but once you do it it’ll be great. That’s what stopped me for awhile–not wanting to deal with the hassle. In the end I wish I had done it sooner! I would definitely gone self-hosted at first, too. It was kind of a pain, getting everything transferred over. Great post!! I am now feeling so far behind because I’m still not self hosted and am slightly terrified of the whole process. It’s on my next year to do list, but who knows what I will lose in the transition when I’ve been doing it that long by then?! Really it is unique to everyone what to do with it, but I found that if I wanted to control my site and be able to customize things I needed to be self hosted. Don’t worry it is never too late! I didn’t lose anything in my transition (thankfully), but some of my formatting ended up a little weird on older posts. Just make sure to make friends with your hosting provider and they can walk you through it. Some even have an extra paid option where they will migrate everything for you so you don’t have to worry about the hassle! Love this post. I just started blogging again for the second time around and approached things so differently since I learned from my mistakes last time! These are super helpful – especially the editorial calendar tip. Thanks lady! Erin, what a great post! I’m relatively new to the blogging world, and these tips are great for those just starting out. Question for you: do you have any tips for reaching out to brands and/or other bloggers for product reviews and sponsored posts? In your opinion, is that something that a new blogger should wait to do until they have a decent following? That’s something I’m struggling with currently and would love to know if you have any advice. Thanks for a great post here! Can’t wait to explore the rest of your blog! My tip would be to reach out to brands that you want to work with with possible ideas for partnerships. Remember that it’s not about what you get out of it but how you two can work together as a team. There is no hurt in reaching out no matter what your following is and the worst thing they can say is no. If you don’t reach out at all though then there won’t even be the possibility of a yes! I’m horrible at commenting on blog posts. I read your blog religiously, but you would never know because I don’t comment. I read it and I like it…but then I move on. Connection is the biggest thing about blogging and if will make or break you. Thanks for posting this. Thanks for reading Angela! I am always following your 2156746 races you do haha. Wish we had gotten to know each other better at Fitbloggin! I love this post! And I can so relate. Especially to the part about comparing myself to other bloggers. I have to just be who I am and stop worrying that I’m terrible at blogging because someone else is so much better. I also need to check out the calendar you mentioned! Exactly! And yeah, CoSchedule is a life saver! This is just what I needed to read. “Remember that it’s MY blog”. I have struggled over the years because of all the amazing blogs I read that I felt mine was somehow not up to par. On the positive side, it is up to par because it’s me! On the negative side, I obviously set the bar too low for myself up until now. Time to up it up a notch. Exactly! The only think you can do is be the best version of yourself. You can do anything you set your mind to. Let me know if you try CoSchedule and how you like it. Thanks for reading Patrick! I agree with you on all of these, especially #4! I had that in the beginning, but these days I have to remind myself quite a bit. What helps is looking back on my blog posts and being happy that I documented all my life stages! I was just saying that yesterday as I referenced a post from almost a year ago when I was about to move to Chicago. It’s great to be able to look back and remember those things! Thanks for sharing Erin! These tips are helpful. As an RD and newbie blogger (launched in November 2015) I appreciate any help and support I can get so this post is awesome! Congrats! Feel free to shoot me an email at erinsinsidejob@gmail.com if you have any other questions. I love to chat about blogging!! Hi Erin, I am a late arrival to writing, now my children are grown up and I have time. I have been thinking about a blog for some time (procrastinating really), and have found your comments very useful. That’s so great! Do it Julie!! Hi Erin! I know this is an old post, but I found it to be super helpful. I’m finally taking the plunge this weekend in getting a camera and joining the Windy City Bloggers Club! Your tip about treating it as important is really resonating with me right now. I’ve been following your posts and Instagram as well and have found your story super inspiring! Thanks for being so open to sharing your journey. Yes! Do it. I’m a big believer in signs and trusting your gut. Let me know if you have any questions you don’t see answers to and I hope your wrist gets better! !